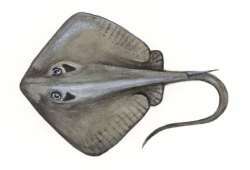 This is one of the smallest of the stingrays, the flattened pectoral fins of the disc are continuous and extend anterior to the head and posterior to the pelvic region. It also has an elongated snout. Their diet consist of crustaceans and clams. The Atlantic Stingray is found along the Gulf of Mexico and the southeastern Atlantic coasts, ranging as far north as the Chesapeake Bay and as far south as Central America. The stingray prefers warmer waters which induces seasonal migrations. They are found as far north as Chesapeake Bay when the water is warm than moves south to warmer waters during the winter months. The Atlantic Stingray has a maximum disc width of 12.8 inches for males and 14.6 inches for females.